So this Sunday happens to be the season finale of Trueblood on HBO, and right now you may be wondering “well what the hell does that have to do with D&D, and why am I reading this?”and in fact it has a lot to do with it, at least in my world. I take a lot of inspiration for my D&D games from movies, games, and television – particularly from the horror genre as it’s my favorite, and my gaming group regularly gets together to watch this show before our D&D game. 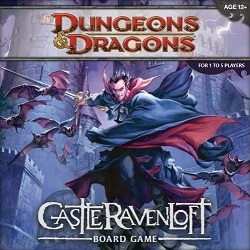 So I’m inviting my group over early for a day of vampires and good times and I figure what better way to kick that day off than with a game of Castle Ravenloft! Problem is, my group of friends including myself totals to six, and Ravenloft being a DM-less game only accommodates for 5 players. After reading the interview with Mike Mearls over at Obsidian Portal I realized the game probably would scale just fine if you added in another class seeing as how he was talking about once the Wrath of Ashardalon board game comes out you could potentially play either game with 10 people. I’m going to entrust myself enough to attempt to create a 6th class for Ravenloft in the mean time, basing abilities from those already existing and creating a set of 10 cards for that class just like the rest. I’d like to create something that mechanically provides some variety to the game space while still justifying the setting that is Barovia (I can’t really see shaman, shardminds, psionics, etc. here). Perhaps a class with some evil smiting specialties, a counterpart to the cleric like a Paladin or an Avenger? So I’m taking up a vote, what do you guys think? What would you like to see added in? Whatever is decided I will be putting up on the site here for free via download as a PDF. Vote & gimme feedback please! In my latest blog post I have both a Warlock and a Druid ready to roll. Since writing that entry I’ve played 3 or 4 games with those classes and they seem pretty balanced. well judging by votes it looks like I might be designing a paladin, so if you make a warlock maybe the community will end up with two! Nice. I was looking over the PHB last night to see what I could come up with for an unofficial homebrew 6th class as well, and Paladin was my choice. As much as I love Avengers, I gotta vote Paladin, especially with the Holy Avenger treasure card floating around in the deck! Harkon Lukas cannot be if you do not add the bard. @ B. Lynn I fixed that, thanks for pointing that out for me by the way. Not sure how I’ve let that slip for so long. lol. My vote is for a Barbarian! Thanks for visiting, I’ll que up a barbarian soon!